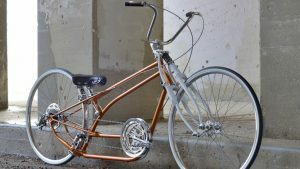 One cool aspect of running a large online community for custom and vintage bike builders is that there’s never a shortage of amazing rides to showcase. This is where Garry Weston and his stretched cruiser “F-BOMB” come into play. 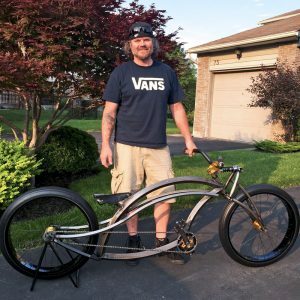 Garry will not deny that he is a “bikeaholic.” He has a familiar story that many of us can relate to. He rode BMX back in the 80’s and 90’s, eventually got hooked on cars, got married, had a couple of kids and suddenly found himself back in the world of bikes. We’ve seen a few of Garry’s builds that he posted on our Facebook page and he’s definitely got an eye for style. 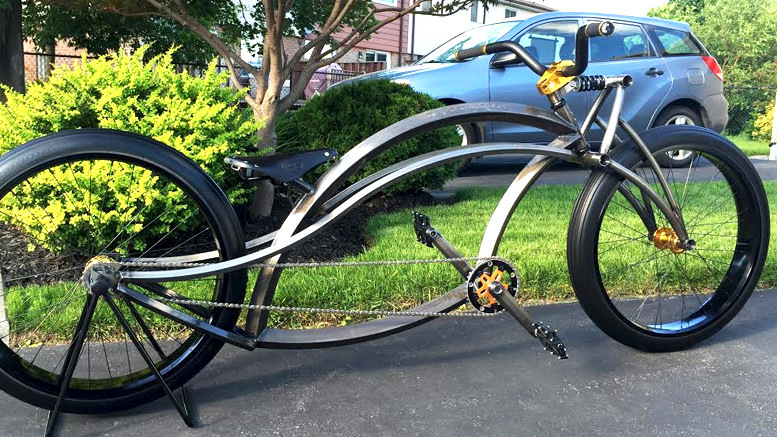 This bike in particular stood out among the rest and we were eager to put it in the spotlight. 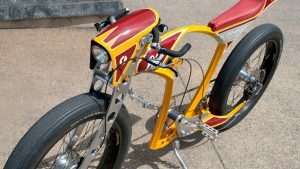 He started with a raw finished Firebike’s Fluid frame and then added a goCruisergo springer fork. That’s a pretty stout base for just about any build. The rest of the parts list includes…Johnny Chopper HUTCH replica cranks, Rob’s Son 26 x 3 (front) & 26×4 (rear) wheels with Sturmey Archer hubs, Project 346 balloon tires, a Box BMX stem, custom made handlebars and a Brooks B17 saddle. He chose to leave the frame and fork raw and had them both powder coated clear. 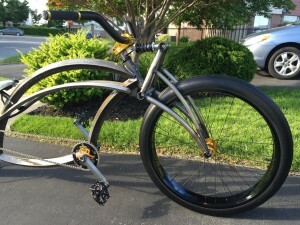 The combination of the raw finishes, gold anodized parts and the black wheels make this one wicked looking machine. It’s pretty safe to say that no matter where he takes this beast, he’s going to be the center of attention. It has the look of a robotic raptor ready to claw it’s way past anything that gets in its way. 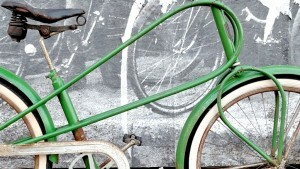 It makes fixed gear bikes whimper and run for their skinny jean wearing mamas. 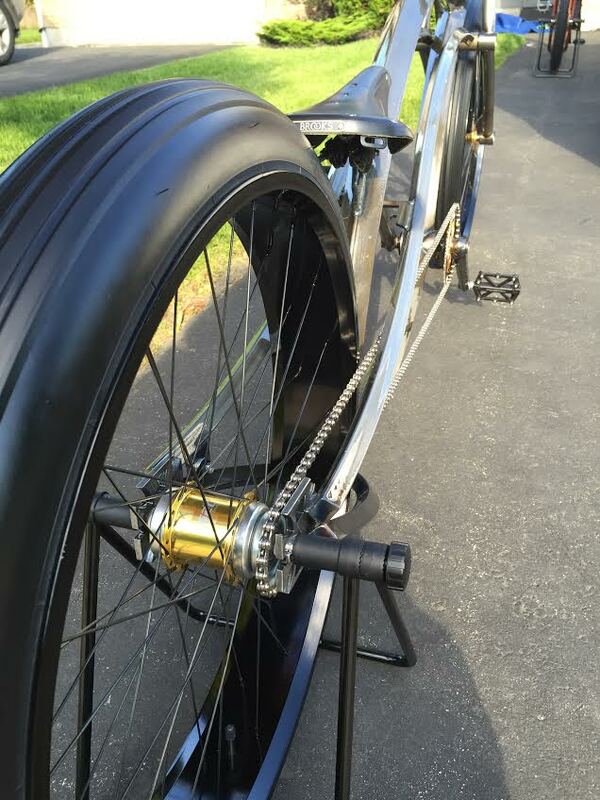 Seeing as how Garry readily admits to his bike related addiction, we have a feeling this won’t be his last build. Fortunately for him, he has a great wife that shares his passion for cool cruisers. That in itself gives him an advantage that most builders only dream of. We look forward to seeing what what other amazing rides Garry cranks out in the future. If you’ve got a tricked out custom bike and you want to be in our Builder’s Spotlight, send us a photo. Also subscribe to our email newsletter to see other cool cruiser related news and reviews. Previous PostAUTOCYCLE BRINGS BIG BUCKS!